Very interesting piece by ubergeek Neal Stephenson over at Slate, where he wonders why it is that we’re still stuck in the rocket paradigm of space launch tech. In two words: path dependency. The above circumstances provide a remarkable example of path dependency. Had these contingencies not obtained, rockets with orbital capability would not have been developed so soon, and when modern societies became interested in launching things into space they might have looked for completely different ways of doing so. Before dismissing the above story as an aberration, consider that the modern petroleum industry is a direct outgrowth of the practice of going out in wooden, wind-driven ships to hunt sperm whales with hand-hurled spears and then boiling their heads to make lamp fuel. It’s this sort of thinking that makes Stephenson’s novels so fascinating to me… and, I fully expect, what makes other people bounce right off them. To Stephenson, everything is a system, and a system is a sort of story. Or maybe it’s the other way around? Anyway, the point is that for all our talk – and worship – of innovation, we’re mired in a whole interconnected set of path dependencies, a kind of civilisational stasis where we don’t do amazing new things so much as we find new ways to do the same things we’ve always done, only bigger, faster and with greater consequences of failure. … the endless BP oil spill of 2010 highlighted any number of ways in which the phenomena of path dependency and lock-in have trapped our energy industry on a hilltop from which we can gaze longingly across not-so-deep valleys to much higher and sunnier peaks in the not-so-great distance. Those are places we need to go if we are not to end up as the Ottoman Empire of the 21st century, and yet in spite of all of the lip service that is paid to innovation in such areas, it frequently seems as though we are trapped in a collective stasis. As described above, regulation is only one culprit; at least equal blame may be placed on engineering and management culture, insurance, Congress, and even accounting practices. But those who do concern themselves with the formal regulation of “technology” might wish to worry less about possible negative effects of innovation and more about the damage being done to our environment and our prosperity by the mid-20th-century technologies that no sane and responsible person would propose today, but in which we remain trapped by mysterious and ineffable forces. A fascinating and provocative read: go see the whole thing. Primarily web-based; custom apps for assorted mobile platforms. Nothing that hasn’t been tried (or at least suggested) before, but to my knowledge this is the first web-published shared-world project to come from some really big name authors. There have been others (like the Continuous Coast project, which appears to have ground to a halt if the forums are anything to judge by), but bold experiments like this are always going to have need of the visibility (and, one assumes, investment) that comes with a recognised author if they want to attract a critical mass of attention. Completely absent thus far (at least after a cursory search) is any information on how The Mongoliad will be monetized, if at all; I suspect that may not be finalised yet, and that they’ve done this teaser launch in order to feel out what aspects the punters are most interested in. Also a lack of detail on how the fan-created content (or the original content, for that matter) will be licensed – I’d love to see it announced as a Creative Commons project, but I rather suspect it won’t be quite that wide open. So, let’s give them some market research, hmm? Let’s assume The Mongoliad comes as a non-free app: are the listed contributors big enough names that you’d consider paying for a serial novel by them? If so, where’s your price point? Scientists surveyed plastic distribution and abundance, taking samples for analysis in the lab and assessing the impacts of debris on marine life. 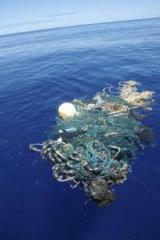 Before this research, little was known about the size of the “garbage patch” and the threats it poses to marine life and the gyre’s biological environment. On August 11th, the researchers encountered a large net entwined with plastic and various marine organisms; they also recovered several plastic bottles covered with ocean animals, including large barnacles. This reminds me of the great junk armada depicted in Snow Crash by Neal Stephenson. It continues a line of prototype devices created at the USC Viterbi School of Engineering that can perform the electronic operations now usually handled by silicon chips using carbon nanotubes and metal nanowires set in indium oxide films, and can potentially do so at prices competitive with those of existing technologies. Its creators believe the device points the way to further applications, such as flexible power supply components in “e-paper” displays and conformable products. This sounds like the sort of development that could lead to something like The Young Lady’s Illustrated Primer of The Diamond Age by Neal Stephenson.